The first season playing basketball in the NCAA for Diandra Tchatchouang has seen her pick up ACC conference awards. She was named in the season's rookie team as well as conference All-ACC Academic team. 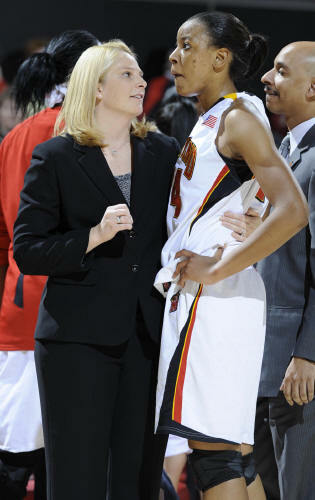 Brenda Frese (left) has been head coach at Maryland University since 2002-2003. 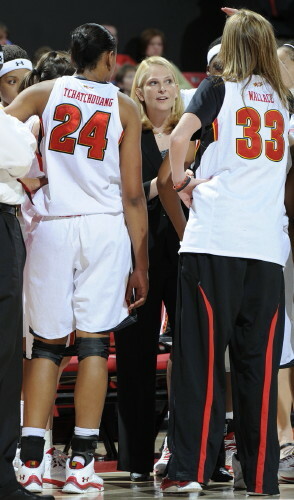 In 2006 she led Maryland to the national title. This season Maryland missed out on the NCAA big dance but took part in the WNIT and were eliminated during the round of eight (elite 8). Coach Frese tells us about some personal moments with Tchatchouang. She also explains briefly about the transaction of the programme and the rebuilding process and finishes with how Tchatchouang has developed since she started playing basketball on her team. Diandra Tchatchouang gives some insights to her first season playing basketball in the NCAA. She also talks about her hopes for next season and the funniest moment with her coach. "It is hard to pick just one moment that would be the funniest. We are a program that likes to have a lot of fun and I think that it is important, because it is a long season and there is a lot of pressure on our players as students and athletes. I remember the first day that Diandra arrived here in the U.S. I went to the airport to meet her when she got through immigration. I wore a "France Basketball" t-shirt that I had received on our team trip to France back in 2006. It put a smile on Diandra's face when she saw me wearing it. I wanted her to know how much we would support her and wanted her to have a great experience. On our Halloween holiday, it is tradition that people wear costumes. We had practice that day, so to keep things fun, when I walked onto the court, I was dressed as "Harry Potter". I even had a magic wand. I went around and gave each of our players a piece of candy and told them "Happy Halloween" in my best Harry Potter voice. The players were laughing at me and I think it was a fun introduction to Halloween for Diandra. I'm guessing she had never had a coach do that before. Another funny thing that comes to my mind is that Diandra not only has to learn English, but also the slang that Americans use. One of my assistants, David Adkins, is a great player development coach and he has spent a lot of time with Diandra. David speaks very fast and uses slang at times. I know that at the beginning, she couldn't understand everything he said. So, we have fun with Diandra, telling her that when she finishes at Maryland, she will speak three languages - French, English and Coach Adkins. "The biggest thing for your readers to understand about Maryland is that this past season, we were very much in a transition phase. Over the previous two years, we graduated some very accomplished players who are now playing professionally. So, this year, we started to re-build. Duke was in a different situation, with many experienced players and the expectation that they would be one of the better teams. Despite that, we had three very competitive games against them. Ultimately, I'd say their experience and depth of very talented players were two of the biggest differences. I'm sure these games were new experiences for Diandra, because Maryland vs. Duke is a rivalry. We have great fans here at Maryland and there were over 10,000 fans in our arena the night when Duke came to visit us. Later in the season, when we played at Duke, Diandra had one of the game's most memorable plays. Duke has a very good guard named Jasmine Thomas who was going in for a transition layup. Diandra chased her down and pretty much made everyone's jaw drop when she jumped and had a monster block on Thomas' attempted layup. Jasmine is such a good player, I don't think that has happened to her many times before. It also showed what a great competitor Diandra is, because she could have easily given up on the play. We are excited going into our off-season, because we had many young players gain valuable experience this past season. We are also adding five new and very talented players to our team for next season. So, our rebuilding process continues, but we are making good progress and we will be a better team next season with more weapons. Diandra will be a very important part of the team. I expect her to be a leader. She now has a full season of competition behind her and a better understanding of everything - language, team, system, rules, culture, etc. Diandra is a very intelligent young lady and doing great in school. She is a pleasure to coach and one of the most self-motivated student-athletes I have ever had on our team. And she is a wonderful person - everyone here at Maryland that has met Diandra loves her. We are very lucky to have her and want to help her be successful in every way we can. She is a great representative of France. Allez les Bleus. Allez Diandra." Diandra Tchatchoung managed to take some time out of her busy schedule to answer a few questions. "This year has been so fun, but if I have to pick only one moment I would say the Halloween day. We were going to start practising and Coach B came on the court with a "Harry Potter" costume throwing some candies for us. That was so funny! That shows me a lot about coach B's personality. She is very humble." "It was a lot of fun to play against Allison, but it was more than that. This game, Maryland vs. Duke, is a big rivalry. The atmosphere in the arena was crazy. Everyone is waiting for it. These games were tough and very close, but I cannot wait to play them again and finally beat them. I know my team can do it." "It feels good to start the post-season. The season was long, so now we have the opportunity to work on our weaknesses and get ready for next season. I love working on my game, so I am very excited about the individual workouts."